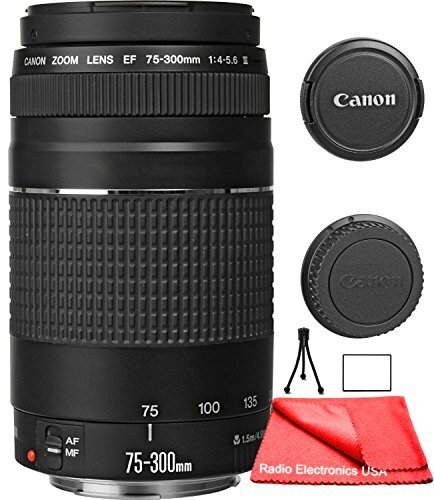 Capture the far-off action of fast-paced sports or zoom in for an intimate portrait with the Canon EF 75-300mm telephoto zoom lens. The optical system, construction, and exterior are the same as the EF 75-300 mm f/4-5.6 III USM's. The difference is that it uses a DC motor instead of a USM to drive the AF. As with all Canon lens, this 75-300 model carries a one-year warranty. Focal length: 75-300mm Maximum aperture: 1:4-5.6 Lens construction: 13 elements in 9 groups Diagonal angle of view: 32 (at 11 feet) to 8 degrees (at 15 feet) Closest focusing distance: 4.9 feet Zoom system: Rotating type Filter size: 58mm Dimensions: 2.8 inches in diameter, 4.8 inches long Weight: 16.8 ounces The most affordable of Canonís long telephoto zooms, this lens is excellent for subjects from portraits to wildlife and nature. It shares the same 13-element optical system as the 75-300mm USM lens, but uses a DC motor for autofocus. Close-focusing down to 4.9 feet (1.5m) allows filling the frame (at 300mm) with a subject the size of a dollar bill, and itís compatible with the Canon 58mm Close-up lens 500D for even more spectacular shots of small objects. Isolate the Interesting Part The eye tends to see the whole rather than the individual parts. It also sees whatís near and not whatís far. By bringing attention to those things missed by the eye, you can create many interesting pictures. It could be the grimace of an athlete, the grill of a classic car, or a girl against a blurred background. Telephoto lenses can also compress images to give dramatic effects. You are limited only by your imagination. If you have any questions about this product by RadioElectronicsUSA, contact us by completing and submitting the form below. If you are looking for a specif part number, please include it with your message.